Fraser—shall I curse him for steal­ing my wife, or bless him for giv­ing me my daugh­ter? Though like­ly this is just the prod­uct of jeal­ousy and imagination—I know what the bas­tard looks like, well enough; I see his face on my daugh­ter, day by day! I can almost feel him, some­times, look­ing over my shoul­der, stand­ing across the room. Hadn’t thought of this before—do you sup­pose I’ll meet him in the sweet by-and-by, if there is one? Should we meet as friends, I won­der, with the sins of the flesh behind us? Or end for­ev­er locked in some Celtic hell, with our hands wrapped round each other’s throat?Whoever he was, when­ev­er he was, I want­ed noth­ing more in life than to see him—and to kill him. beau­ti­ful and so well done. Thank you for the won­der­ful and poignant Jamie and Frank moments. 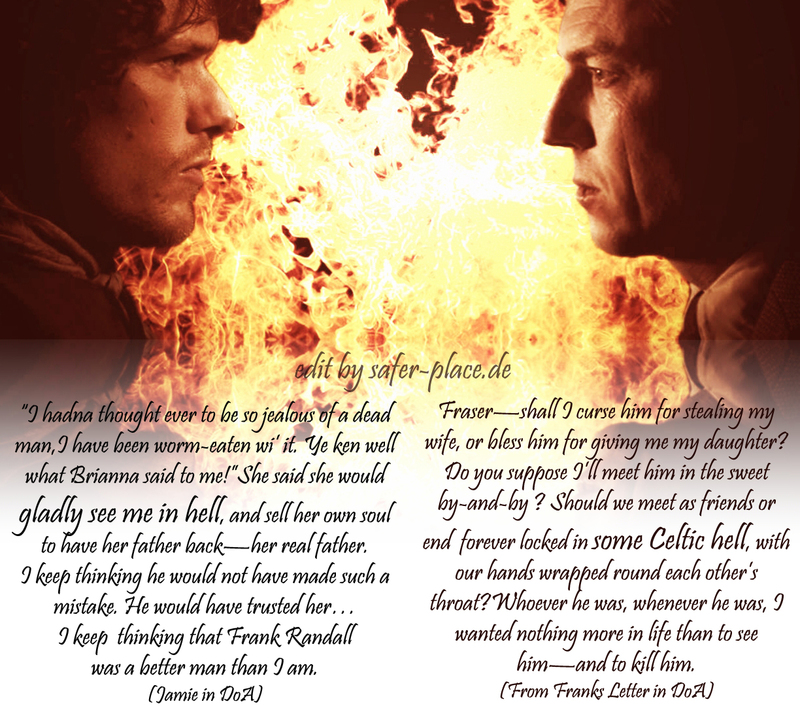 I real­ly miss Out­lander but with these kind of reminders why Jamie is “King of Men” and the undy­ing love Jamie holds for Claire, is the rea­son it will always bring me back to read­ing my Out­lander series again and again. I find all oth­er books rather bor­ing ?so I have start­ed read­ing Voy­ager for the fifth time. Thanks for the Jamie moment. Sam Heughan Is Jamie Fras­er and he fits the role very well. When I read my Out­lander series, I see Sam Heughan in my minds eye.? ?.